About 15 years ago in late January, we had some nasty weather while we were calving. The early-born calves were doing fine in those storms, because they had their calf houses to crawl into whenever they wanted to get out of the wind or blizzards. The final week in January was very bad. First it snowed, then it got windy and cold (10 below zero, but with the wind chill factor, it was equivalent to 45 or 50 below). 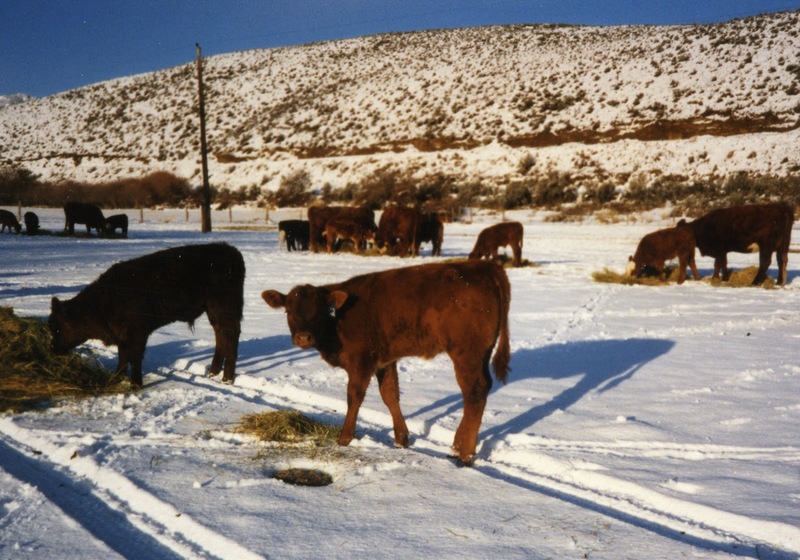 That morning when I went out at daylight to do chores and feed my horses, I heard a cow bawling in the field above the house, so I hiked up there through the snow to see what the problem was. she got sick during the big snowstorm. 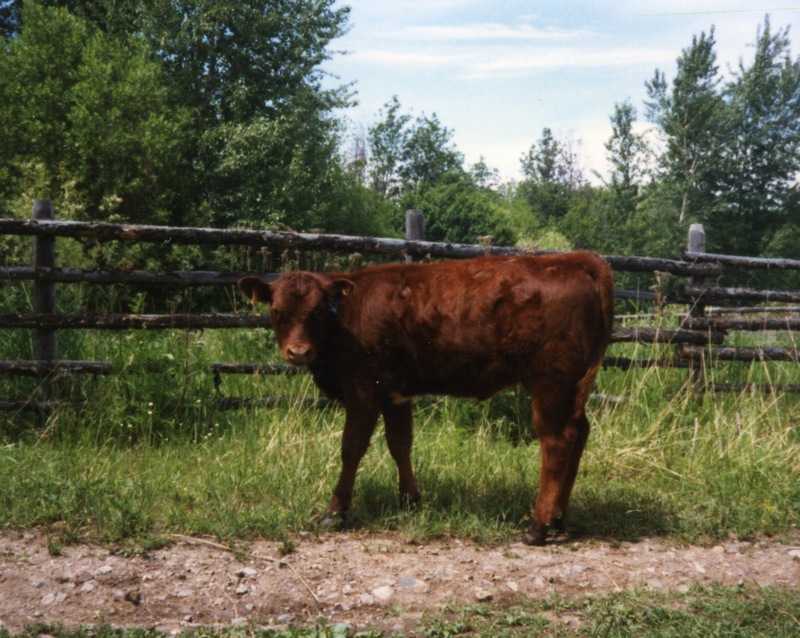 The cow bawling was Henny, an eight-year-old crossbred cow with a heifer calf named Witsi. I couldn't find the calf anywhere, and Henny didn't know where she was. I looked in the calf houses and in the bedding areas along the fences where we put out straw, but I didn’t find the calf. Finally I saw a hump in the snow along the far fence and ran over there. Flat out and covered with 2 inches of snow — there was Henny's calf, looking dead. But as I brushed the snow off her head, I could hear her wheezing slow breath. She was still alive! I ran to the house where Lynn was getting ready to go and feed the yearlings, and we brought the jeep up into the field to get Witsi. She was a big calf, nearly a month old, and it was all the two of us could do to lift her limp body into the back of the jeep. We drove down to the house, with Henny following us. 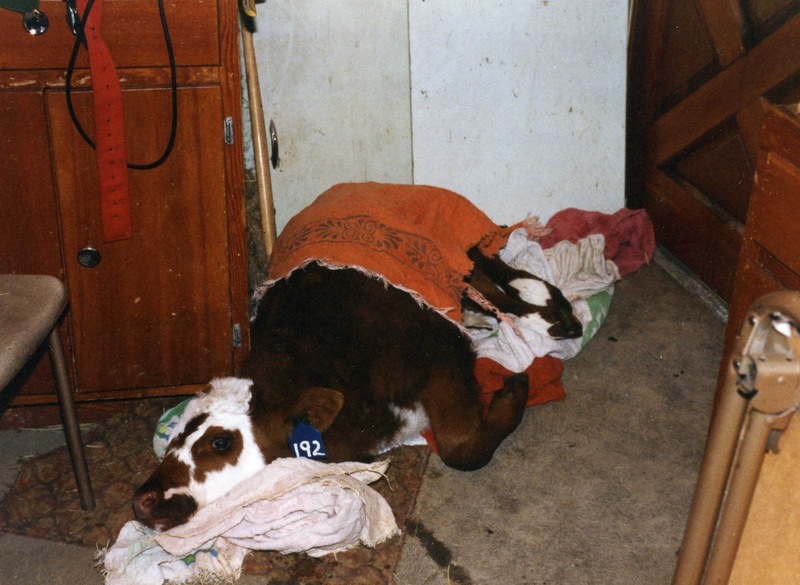 We left the cow in the corral as we drove through and brought the calf into the house to warm her. This was a case of "colicky bloat," an acute gut infection that damages the intestine lining and sends toxins into the calf's bloodstream. Witsi had been fine the evening before, but she got sick during the night. We didn't know about the problem in time to give her our usual treatment of castor oil and oral antibiotic (which quickly reverses this condition). neomycin sulfate solution via stomach tube. It hits really fast. 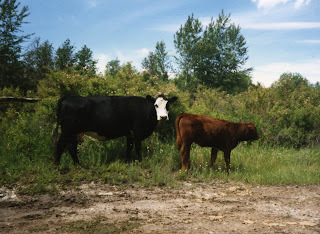 If you find a calf in the first stages of infection, when he has gut pain, is kicking at his belly, or is starting to bloat, you can save the calf by quickly giving castor oil and a liquid antibiotic into the stomach, via stomach tube. But once a calf goes into toxic shock, he’s hard to save. and given IV fluids and medication to help reverse shock. We had to reverse the shock. I gave Witsi an injection of dexamethasone and called our vet's young associate, who lived 3 miles away from our ranch (it was early morning, and she hadn't gone to the clinic in town yet). We needed help to give Witsi intravenous fluids; oral fluids are of no use in this serious situation. 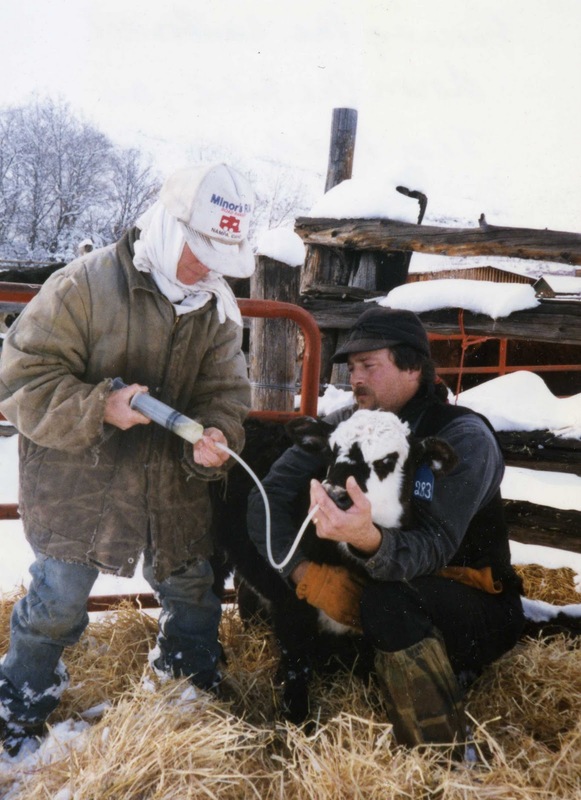 But when a calf is deep in shock, the jugular vein is collapsed and can be difficult to put a needle into. While we were waiting, I managed to get a stomach tube into Witsi (through her nostril) and gave her 6 ounces of castor oil and a dose of neomycin sulfate solution, to fight the infection and to help the shut-down gut start working again. Renee came quickly to our place, and we worked for over an hour trying to get fluids into the calf, there on the kitchen floor. She managed to get the needle into the jugular vein long enough to get one liter of fluid in, but the needle (and the catheter she tried after that) kept slipping out of the vein. Then she couldn't get it in again even after making an incision through the skin right to the vein. Finally she had to give up and go to the clinic and told us she couldn’t do anything more for the calf. Witsi was still alive but deep in shock. We covered her with heating pads and put two electric heaters beside her, trying to warm her up, while we rubbed and massaged her body to help her failing circulation. By now she was dry but still very cold from being covered with snow, and she was in shock. Her body temperature was too low to register on my thermometer. Witsi hung on stubbornly to life, and we didn't want to give up. So we called the other vet at the clinic and asked if he thought there was any chance for the calf. He said he would try to get intravenous fluids into her if we brought her in. So we loaded Witsi into the back of a covered pickup and put warm towels over her to keep her warm during the 12-mile trip to town. Dr. Cope managed to get a catheter into the jugular vein and put several more liters of fluid into her. By evening Witsi was out of shock and had regained consciousness. She was urinating (a sign that she now had adequate fluids in her system and her kidneys had not been damaged by the toxins in her bloodstream) and passing large quantities of foul, watery diarrhea. Dr. Cope phoned to say she was out of critical danger and we could bring her home. My husband Lynn took the car in to get her and wrapped Witsi in a tarp, in front of the back seat. It's a good thing she was wrapped up, or she would have left puddles of diarrhea all over the car! After we got Witsi home in our kitchen, we gave her a half-gallon of fluid and electrolytes by stomach tube. Her temperature was up to normal, and within a couple of hours she was able to stand. We took her out to the barn — into the stall next to the stove — and put her mother with her. It was a very happy reunion, though Witsi was still too weak to nurse. We milked out the cow so she wouldn't have such a full udder and gave Witsi more fluid and electrolytes the next morning. She was nursing her mother again by noon. Over the next two days we had to give her fluids several times (and milk Henny one more time; the calf didn't nurse enough the first day) and kept her on antibiotics to help prevent pneumonia and to combat the joint infection she developed from toxemia. Bacterial toxins in her bloodstream caused septic arthritis — an infection that settled in the joints. For several days she didn't want to stand up much or walk (and walked very stiffly), because her leg joints hurt. Dr. Cope said that the toxins circulating in her body while she was in shock had affected her joints, just as if she'd had septicemia from navel ill. This can be a very serious condition, with infection permanently damaging the joints, so we kept her on antibiotics (LA-200) for as long as she had any sign of joint pain. We knew that if we quit too soon, she would relapse and possibly be permanently crippled by joint damage. We gave her injections every 3 days for 42 days, until she was walking freely without lameness. We also rubbed DMSO on her fetlock joints, knees, and hocks, every day for the first week, to help increase circulation in the joints and combat the stiffness and soreness. When she started walking better, we put her and Henny outside, but cold weather made her stiff and lame again, so they went back in the barn until the weather warmed up. That pair has the record for length of stay in the barn, and it took a lot of bedding. We were done calving by the time Witsi took up residence in the barn, so we gave them several stalls’ space (which kept it cleaner). But it was a major clean-out job when they were finally able to live outdoors — and we washed down the stall walls with disinfectant. We have a rule about never putting sick calves in our calving barn, but it was the only warm barn, and it helped save Witsi's life. Technically, she wasn't really “sick” by the time we put her in there; she was past the gut infection and just needed a warm, dry place to convalesce. But we still washed down the walls to make sure the barn would be clean for newborns the next year. We had nearly 40 cases of this acute gut infection that season, hitting calves 3 to 10 weeks of age, after their temporary immunities from colostrum diminished. It was a really bad year because it was so wet; we always have fewer cases when the ground stays frozen or in a really dry spring. We managed to find all the other cases before they went into shock and treated them successfully with castor oil and neomycin. After Witsi's close call, we started checking the fields at night, so we wouldn't miss any sick calves. In February and March it's a long time between evening feeding (just before dark, at 5 to 6 p.m.) and morning feeding (between 8 and 10 a.m.) — about 16 hours. That's too long to go without checking calves. So our daughter and son-in-law hiked through the fields in the middle of the night to check the calves, and we were able to doctor all cases successfully. We didn't lose any calves to scours nor to this mysterious acute gut infection (our vets have never been able to figure out exactly what “bug” causes it, though many ranchers around the valley have problems with it in calves that are 3 weeks to 3 months of age). But we really worked hard to save some of them. Witsi was our "heroic effort of the year"; we came the closest to losing her. Through it all, she got to know us quite well. She never really became a “pet” because she didn't like all the things we had to do to her (especially the injections of LA-200 every 3 days), but she resigned herself to being caught and handled. Henny didn't like our doctoring her baby and would hover over us with great concern but didn't threaten us; she seemed to know we were trying to help. As Witsi started feeling better, she got sassier and would run off when we came to doctor her, but she always let us corner her. She knew it was futile to try to get away. But she still expressed her disapproval — like the time she kicked at me. She shook her hind foot as though she would like to kick but didn’t actually do it. She grew to be a smart, beautiful heifer. She had some joint damage; her pasterns and fetlock joints were a bit upright, and she walked with a slight stiffness. But she traveled just fine and had no trouble running and bucking when she felt like it. Because her mom was one of our best crossbred cows, Witsi had the genetic potential to be a good cow, so we decided to keep her. She had a good attitude about life and was easy to handle when she calved (and felt right at home in the calving barn, since she had lived in there for over a month). septicemia that almost killed her, secondary to the toxic gut infection. We get attached to all our critters but even more with the ones we become intimately acquainted with, like Witsi. When you spend this kind of time and effort with an animal, it becomes special, particularly when it has such an interesting, unique personality. We don't have time to become this closely acquainted with them all (thank goodness we don't have to doctor them all this intensively! ), but the ones like Witsi make us feel glad we are in the cow business, glad we were able to save one that would have otherwise died, and glad to be privileged to get to know her so very well, to gain a bit more insight into the fascinating mind of a smart little cow. Thanks for sharing, its pretty cool. This year I'm looking forward to take a break and enjoy nature as I go for vacation, well maybe after I find some Texas Land Sales. Anyway I really like your blog and i really appreciate the excellent quality content you are posting here.